The Mona Lisa has always been considered in a class by itself. It is said the portrait is the only artwork to have had its own mailbox at the Louvre because of the many love letters that were received for the woman portrayed with the smile known worldwide. The painting evoked such emotion that a spurned lover once shot himself while standing in front of the portrait. What is less widely known is that the Mona Lisa was stolen from the Louvre in 1911 and remained missing for two years. Even more astounding, was that Pablo Picasso, the famous painter and sculptor, was brought in for questioning about the theft and remained a suspect for some period of time. Authorities didn’t discover that the painting was missing until the day following the theft, but once discovered, the Louvre was closed, a new crime fighting technique of dusting for fingerprints was utilized, the French border was closed and mass transportation venues were searched. Shortly after the theft a man contacted the Paris-Journal newspaper which was offering a reward for information about the crime. The man was soon identified as a former secretary to the poet Guillaume Apollinaire, a supporter of Picasso. After questioning both men, police learned that artwork previously stolen by the men had been sold to Picasso himself. Picasso, when detained for questioning, denied knowing that the previously purchased items were stolen and said he knew nothing of the theft of the Mona Lisa. Authorities doubted the claim that he was unaware that he had previously purchased stolen artwork. They did not, however, connect him to the Mona Lisa theft. In 1913, the real thief was finally identified as Vincenzo Peruggia, who was a house painter from Italy. Peruggia always insisted that he only took the Mona Lisa to return her to Italy as revenge for Napoleon’s theft of artwork throughout Europe. Even today speculation continues about whether the thief acted alone and if there was a story behind the story. 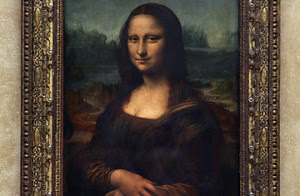 Through it all, Mona Lisa continues to smile knowingly, but never revealing more of her adventurous past.